A 54th birthday can be an important birthday for a woman. It is the last year before she turns 55, which is the age that some people retire. Since 54 is not a milestone birthday, it is best to save birthday themes such as "This Is Your Life" or a roast for the following year. Instead, create some old people party game themes, or throw a decades, scavenger hunt or memory lane party. Invite some 50-something friends of the birthday girl and play children's games with old people themes, suggests Celebrations.com. For example, play "Pin the False Teeth on the Old Lady" instead of Pin the Tail on the Donkey. You can also play "Spin the Bottle of Antacid" or "Drop the Diaper Pins in the Milk Jug." All these games can bring a lot of laughs. Invite guests to bring gag gifts like old lady shoes, a bonnet or something a grandma might wear. A decades party can be a lot of fun at any age, especially the longer you have been out of high school. Throw a decades party that reflects the year the birthday celebrant graduated, then invite some old high school friends. Have people wear clothes like they wore in high school. Post up plenty of old high school pictures of the birthday girl and her friends. Play music from that particular era as well. There are many ways to throw a scavenger hunt party. You can place the items locally in the yard or house or scatter things around town. If you spread your scavenger party across town, divide your party into two or three teams. Write various clues telling where everyone can find the first clue. Place the clues in little plastic boxes along with each item to be collected. The team that finds the clues and collects the various items first can win restaurant gift certificates or movie passes. You can make a memory lane party as extensive as you want. Start by inviting all guests to write down special memories of the birthday celebrant. Create a timeline of the person's life, along with lots of pictures. Write down major accomplishments of the birthday celebrant, including where she lived as a child, schools she attended, streets she lived on, when she got married and when her kids were born. After cake, ice cream and the opening of gifts, have everyone sit around and read some of their favorite memories. 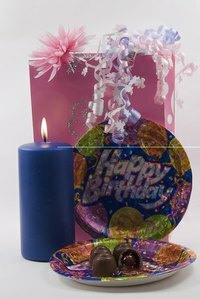 Encourage people to tell both funny and sentimental stories about the birthday girl. Save the timeline and memories in a scrapbook.